Made from Hand Sanded & Stained A-Grade German Beech Wood – Lifetime Warranty! The Byron Bay Pilates Co. Full Trapeze Cadillac Table is a beautifully finished, complete Trapeze system, built for stability and easy adjustment. It is perfect for both the home or professional studio environment. The Full Trapeze Cadillac Table is designed for premium performance so that you or your clients can benefit from the incredible range of Pilates exercises, with full acrobatic hanging capabilities. 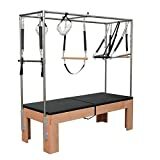 Comes with full stainless steel trapeze structure, beech roll down bar, stainless steel push through bar, two sliding bars, springs with hand/foot straps, one pair of fuzzies. Fully adjustable system which can cater for any individual arm movements, push through exercises and full acrobatic trapeze workouts. High density EVA Foam Padding with professional grade upholstery on table to give the user support and premium comfort. High quality materials – the base frame is made from A-grade German Beech wood which has a lifetime warranty. All other parts are made from stainless steel and anodized aluminium and have a one year commercial use and three year home use warranty. This Full Trapeze Cadillac Table is a versatile piece of equipment featuring a variety of spring lengths and tensions, as well as multiple spring attachment sites providing different levels of resistance to support or challenge the body. Delivery Notice: Once your order has been placed, our customer service team will be in contact with you to confirm your chosen delivery date. Delivery of your product will be to your front door; we recommend you have assistance on hand to help you move the product inside the premises.